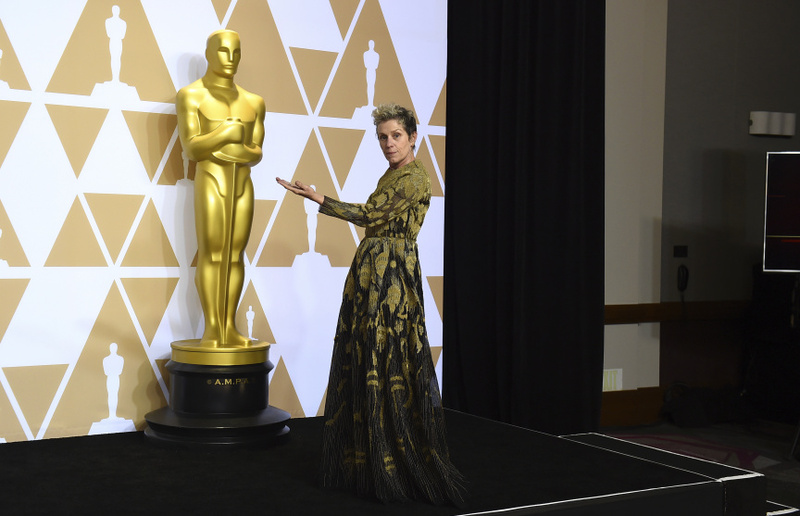 LOS ANGELES (AP) — A man was arrested and is accused of stealing Frances McDormand's Oscars trophy after the Academy Awards on Sunday night, Los Angeles police said. The two-time Oscar winner, who swept trophies at the Golden Globes, Screen Actors Guild, Independent Spirit and BAFTA ceremonies, beat out Sally Hawkins of "The Shape of Water," Margot Robbie of "I, Tonya," Saoirse Ronan of "Lady Bird," and 21-time nominee Meryl Streep of "The Post" at Sunday's Oscars. In "Three Billboards," McDormand played Mildred Hayes, a hardened woman seeking justice for her daughter's murder in the crime drama. Her first Oscar came for the 1996 film "Fargo," directed by her husband Joel Coen. Bryant was being held on $20,000 bail Monday, police said. "Who wants to wish me congratulations?" he asked fellow revelers who were walking by, before posing for several selfies.